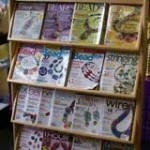 Where can I get free beading Magazines? I need free beading magazine websites so I can order them. I’m starting a jewelry business so I need all the help I can get. Thanks! You’re starting a jewellery business, but you don’t know what products you’ll be selling? I think the first rule of starting a small business is to target a market that isn’t already swamped by a million other people (Ebay, Etsy, etc). But if you like making jewelry, then make what you already know how to, and sell them at local markets, online, etc. When your business expands, when you start making money, then you can invest in magazines that teach you different techniques, or you can buy them when you have some spare cash from other sources. No site will give you free magazines that are worthwhile, in my opinion. You can get basic instructions from a million different sites (do a search for ‘free beading pattern’, for example) but if you want to be serious and make original jewelry to build up a self-sufficient business, you will need to pay for the patterns (check for copyright restrictions) or make them up yourself. Does anyone know anyone or anywhere that’s giving jewelry or beads away for free? I need some for a school activity. Join a Freecycle group in your area and post a wanted ad. You could also try a local bead or hobby store to see if they can donate anything on their clearance racks or if it’s for a good cause, maybe their customers would be willing to donate their “unwanted” beads and jewelry and would let you put in a sign or a container to collect the donations. Where can I order free catalogs for jewelry beads by mail? Fire Mountain Gems. It’s a bead company based in Grants Pass, OR. Just go online and request a catalog – this is a great site, great company and the service and products are high-quality.